This type of concentrated arc lamp was developed in the 1950's in the USA as a light source intended to deliver an intensely bright point source of white light. 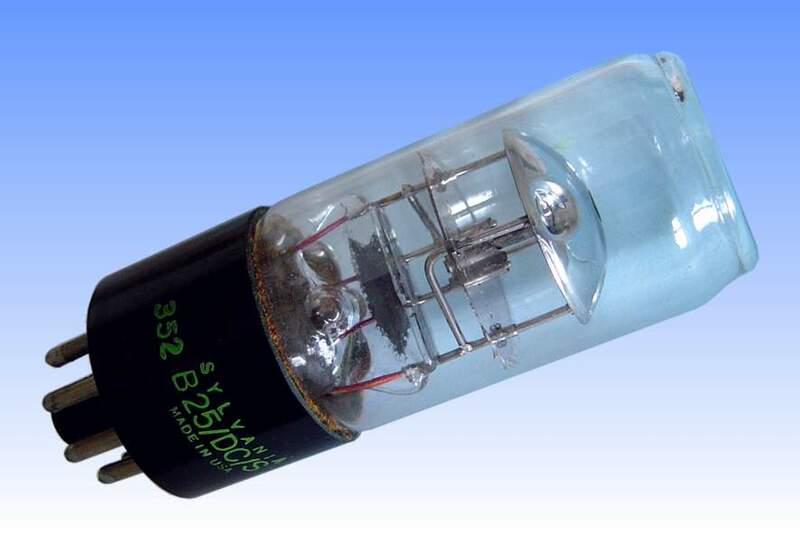 Tungsten arc lamps such as the Pointolite had been known for many years before it, but had the disadvantage that the tungsten bead operated near to its melting temperature, and evaporated rather rapidly resulting in bulb blackening and a short life. As the bead evaporated and shrunk, it would run hotter and hotter until it was molten and the lamp failed. 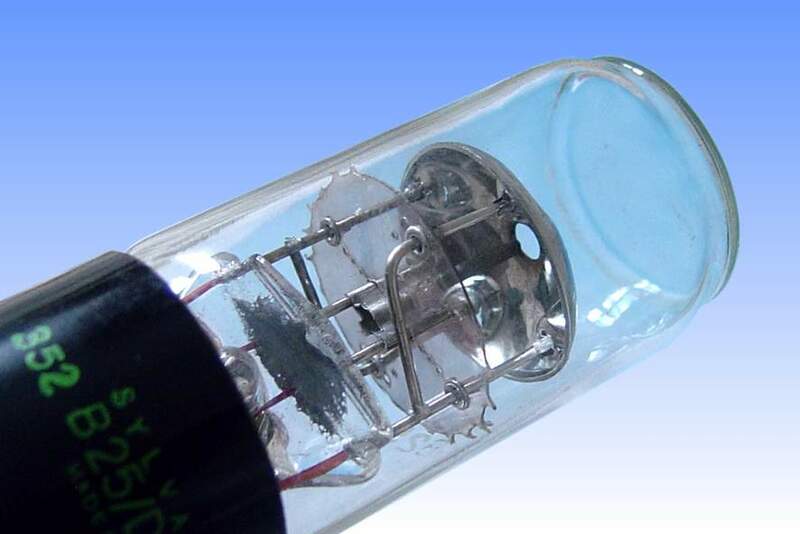 In addition the light is somewhat yellowish, since its spectral emission is essentially the same as any other tungsten filament heated to a similar temperature. The zirconia lamp improved on this by employing a more refractory material than tungsten. Zirconium oxide was chosen, an electrically conductive ceramic. It could be extruded and then fired to produce slender rods, which were incorporated into the lamps as the incandescent anode. The cathode usually took the form of a plate or series of plates made of molybdenum, either surrounding one end of the zirconia rod, or equipped with a small hole through which the rod could be observed. On striking the discharge the zirconia anode becomes intensely heated as it is bombarded with electrons, and is raised to incandescent temperatures. The top window of the lamp is an optically ground glass flat. The incandescence originates from a bead of zirconium metal which is exuded from the ceramic rod, which serves to support it during operation. Zirconium has an improved spectral emissivity over tungsten and delivers a brighter, whiter light. Despite the improved design, zirconia lamps were short lived and soon superseded by mercury arcs. 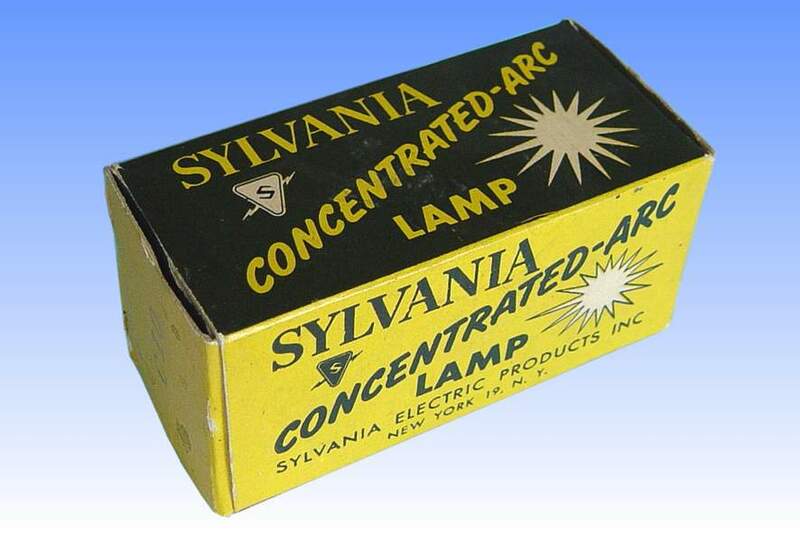 Factory: Boston Street, Salem MA U.S.A.
References: 1) Instruction leaflet for Sylvania Concentrated Arc Lamps.